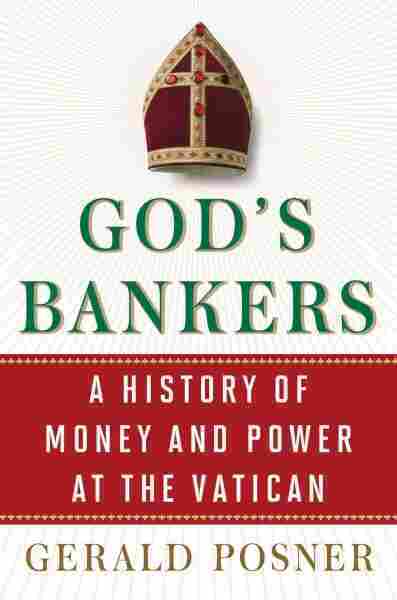 Interview: Gerald Posner, Author of 'God's Bankers: A History of Money and Power at the Vatican' In God's Bankers Gerald Posner explores the history of money, power and the church. During World War II, he says, the Vatican made money off of the life insurance policies of Jews sent to death camps. The Vatican Bank is "essentially an offshore bank in the middle of a foreign country," says Gerald Posner. 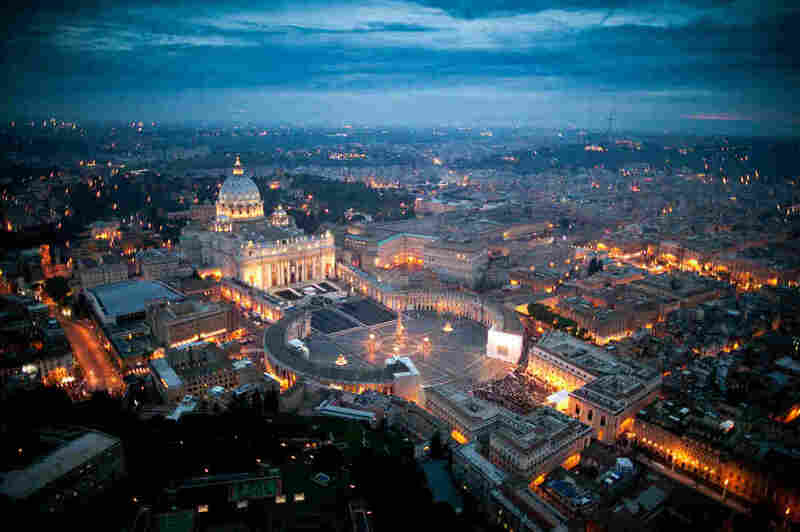 Above is an aerial view of St. Peter's basilica in Vatican City. For decades, the Catholic Church has been dogged by scandals involving money. Vatican City — a sovereign state — controls its own finances through the Vatican Bank. It developed as a cross between the Federal Reserve and an offshore bank. In a new history, God's Bankers, Gerald Posner explains that its roots go back to the mid-19th century. "They had 15,000 square miles of what was central Italy with thousands of subjects," Posner tells NPR's Renee Montagne. "They levied taxes and paid for this lavish lifestyle — with 700 servants and a big and growing bureaucracy around them. Then, in 1870, Italy's nationalists have a revolution. They throw the Pope out, they get rid of the papal states. The Vatican goes from being an empire — an earthly empire — to a little postage-stamp size of property called Vatican City." By World War II, the church had sizable investments and created the Vatican Bank in order to hide its financial dealings with the Nazis from the U.S. and the U.K.
"I was surprised the extent to which the Vatican was deeply embedded with German companies," Posner says. "They bundled together life insurance policies of Jewish refugees who had been sent to Auschwitz and other death camps. They escheated these policies early on — meaning they took the cash value of them." Later, when the surviving children or grandchildren of the victims tried to collect on the insurance policies, they were refused. "These insurance companies would refuse to pay out saying: 'Show us a death certificate,' which they knew was impossible," Posner explains. "They would keep the money." In God's Bankers, Posner sheds light on what he calls "the blood money" that came into the church. On the Vatican being "equal opportunity profiteers"
It wasn't as though they did business with the Germans because they wanted the Germans to win. They did business with everyone, because they called themselves neutral and decided that somebody would win at the end of the war — and they were going to keep their business connections open to everybody. Then, when they saw the war was going against the Germans, they started to hide the connections. And after the war they said, "We didn't do anything wrong." "They abdicated their moral position as the head of the world's largest religion, especially at a time that they continued to make money with the people committing the murder." On how the Church knew what the Nazis were doing but were "frozen by indecision and fear"
The bank officials and those who ran the bank knew very little because, in part, all they wanted to know was what was happening in terms of the war effort and what was happening in terms of business and profits. But on the church end, there's no doubt that they had churches, local churches in all of the countries, that were the ground zeros for the killing zones. The local priests who were not in favor of the slaughter still reported back to their bishops what was happening on the ground. That came in daily reports, and they had unfortunately a very clear sense of what was happening early on. They were just frozen by indecision and fear. They were afraid that if they spoke out, the Nazis might in fact move against Catholics in Germany and even move against the Pope and take him back to Germany as a prisoner. But that fear meant that they abdicated their moral position as the head of the world's largest religion, especially at a time that they continued to make money with the people committing the murder. One of the reasons the Vatican was frozen in fear against the Nazis and had made their alignment with the Fascists in the first place, was that they feared the Bolsheviks more. When John Paul II came in — the first Polish pope, the first non-Italian pope in more than 450 years — and there's still a communist government in Poland ... he formed an alliance with Ronald Reagan. The head of the CIA used to be going over regularly to the Vatican to give him briefings. I describe a new incident in this book in which Italian intelligence agents, they take $3.5 million in gold ingots from a Swiss bank. They put it into the side panels and a false bottom on an SUV and a priest drives it back into Gdansk from Italy so it can feed the resistance against the communists in Poland. So there was a real alliance between American intelligence, the right wingers and the Vatican on this meeting of minds against communism. The thing about the Vatican Bank that makes it different in my view is that it's essentially an offshore bank in the middle of a foreign country — so that once that bank was formed, it meant that somebody sitting over in Italy who had a lot of money, all they had to do was find a priest or cleric inside Vatican city to take their money in suitcases of cash across the street — just wait for the red light to turn green — walk it over on a cart, deposit it in the Vatican Bank, and it no longer could be taxed. It no longer could be followed by Italian authorities. It couldn't be followed for a drug investigation. So what does that result in? It results in the Vatican Bank being one of the top banks in the world for money laundering — a haven often for these business executives involved in scandals in Italy. ... Just in the last decade we learn that the Vatican Bank had an account for [Giulio] Andreotti, who was the seven-time prime minister of Italy, the most powerful postwar politician in Italian history. He had a secret bank account through which over $50 million passed at a certain time, most of which was doled out for political favors to friends. That was what the Vatican Bank had come to be, and it's what I call its "cocaine cowboy" days, the equivalent of — I live in Miami, the crazy period here was the 1980s when the cocaine cowboys sort of ran the roost. The Vatican Bank has had its cocaine cowboy days. The real question is now whether the new sheriff has arrived in town. Is that Sheriff Francis, and can he really bring them to heel or not? I've been impressed by him. He has changed the structure so that it won't have the ability to be at the center of those scandals. And he's brought in some outsiders. They've closed hundreds of accounts that have been open that were tied to people that shouldn't have had them. They are abiding by the rules set by the Europeans for financial transparency because they use the euro. So it's a different era. What could upend it? He needs to be there long enough that these changes can't be reversed by a new pope who gets in and can be pushed around by the strong dominant bureaucrats.